Trapper J specializes in skunk control, skunk Exclusion, and Skunk Removal. We remove wildlife pests in a humane manner and will clean up the mess they may have left behind and repair any damage these wild creatures have caused to your home. Skunk Removal and Control can be a very long and nerve racking process if you do not have the right equipment. Always hire a professional to handle your wild animal problems. The most common problem associated with skunks is they dig in the yards under a structure around your home, skunks should always be removed by a professional as their essence once sprayed can last a very long time. Skunks are very smart and alert creatures, making them somewhat difficult to trap. Don't let the skunks take over your home, give us a call today! 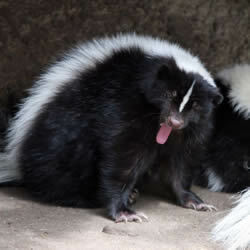 Some of the things we do include skunk control, skunk removal, remove skunks in yard, get rid of skunks under porch skunks or under building, and remove skunks under house and all other places skunks live, and deodorize skunk odor. Get rid of skunks the right way before the problem gets out of control. Trapper J, a North Louisiana Nuisance Skunk Removal specialist is the most professional and humane nuisance skunk service available in Monroe, West Monroe, Ruston, Bastrop, Alexandria, and Pineville in the North and Central Louisiana area.